This unique property is set amongst 4.5 acres covered mostly in native bush located in the Manu Bay Costal Reserve area. Flourishing bird life includes Tui, Kereru, Fantails and Warblers nesting in surrounding trees. Bird song can be heard throughout the day especially at dawn. 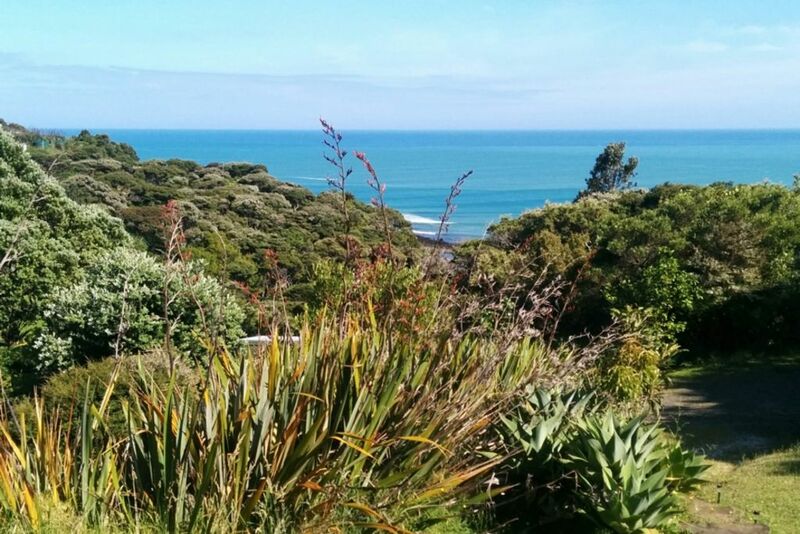 Laze around enjoying amazing ocean views from the cottage or explore private bush tracks down to streams and ocean. Visit Raglan's main surf beach (surf patrolled) 20 minute walk or 5 minutes by car. Also in the area there are surf breaks, surf lessons, boat ramp (1 km away) yoga classes, golf course or sample a range of cafes, bars, shopping and entertainment all available in nearby Raglan village just 7 kms away. This haven is ideal for couples as a romantic getaway or for family/friends looking for a special experience. There is one other house located on the block, out of sight so your stay here will be private. Note: Stairs to loft bedroom are steep. Some parts of the bush track are steep but manageable by people of moderate fitness. There are large rocks on the beach. (my 80 and 75 year old in laws can manage these).Cellphone coverage is patchy. Continue down through the bush to access a secluded beach and world famous surf break. By road ,the cottage is 1km from the Manu Bay Reserve and point break. A few km's further on is Whale Bay and then the Indicators. About 3kms back toward Raglan is Ngarunui beach and lifesaving club. The property has it's own private access track down to the ocean. Then a short walk across the rocks gets you to a small secluded beach. What a beautiful cottage for a beautiful getaway. Cant say enough good words about this place, you have to go there to see for yourself! Thank you so much! Clean, tidy and just spectacular! Loved staying here, could spend quite a lot of time just enjoying the view from the deck! The beach you could access at the bottom was lovely and calm and private. House had everything you need and was comfortable. Would definitely be keen to stay again. My wife and I had a wonderful week long stay. The cottage is a jewel. Hosts were amazing. Lovely property, great owners to deal with. Lovely little Bach with a beautiful ocean view, quiet and the perfect place for a relaxing getaway from it all experience. Recommended to anyone looking for a retreat from busy life.